DC Comics is going all out next season. The CW's Arrow will continue on its ratings rampage. The CW will also introduce The Flash along with the lesser known iZombie. What I found to be surprising was a major network like NBC picking Constantine, a show based on DC's Hellblazer series. Constantine was also made into a movie staring Keanu Reeves back in 2005 which was pretty horrible - sorry Keanu, I like your other stuff, this just didn't do it at all. The show looks way way better than the movie, and by the small glances we've been given, looks to stay much more true to the comics. 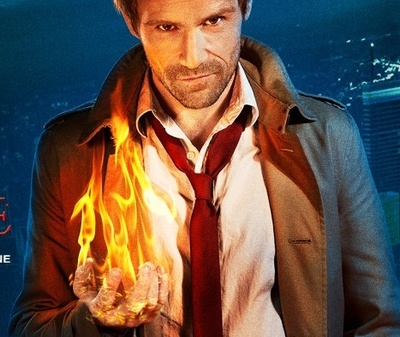 The two trailers look pretty good, those who like Supernatural and Grimm will most likely dig Constantine. What do you think, worth checking out? I was pretty unsure about this show after watching the first trailer, the effects looked pretty cheap and the acting second-rate. The second trailer, however, was a huge improvement. Now I'm thinking, hoping really, that it was just a poor selection in cuts for the first trailer, some of the same footage and dialogue was used in the second trailer but it just felt more put together and made the show look interesting. I'll be checking out Constantine but will I be a regular viewer, only time will tell. On a more interesting note, I like the direction NBC is currently going. They tried 666 Park Avenue a few years ago, along with Hannibal. 666 Park Avenue didn't last past the first season but Hannibal is now in it's third with no signs of slowing. And now NBC is giving Constantine a chance. It's a very dark direction, but it shows how TV is heading back into the realm of scripted fictional shows, and his makes me happy. I loved the movie. Though I have had a crush on Keanu for the last 20 years! I do enjoy shows based on the supernatural, so yes, I'll check it out. I've loved most movies that star Keanu, he's a good actor and normally plays roles I really like, but Constantine just didn't do it for me. I blame the story though, not the actors in the movie. I feel the same way about the Green Lantern movie, Ryan Reynolds played his part really well, and I thought he made a great Hal Jordan but the movie itself was horrible. I see your point. Green Lantern was terrible! After watching the trailers.That stuff is best left alone.